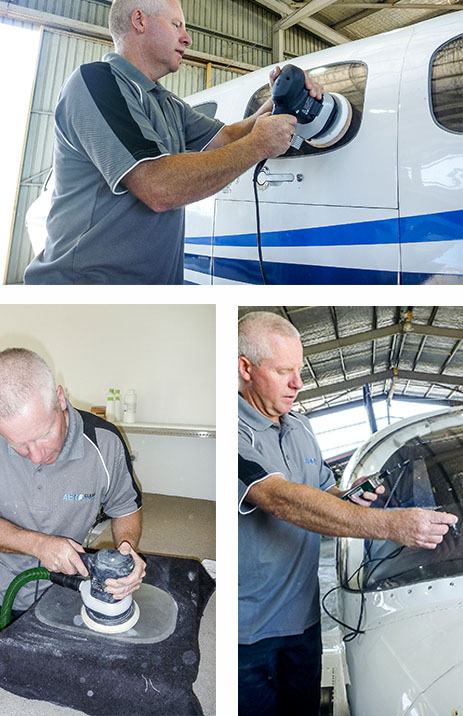 Refurbish aircraft windows at our facility in Armidale, or on site. Refurbishing your aircraft windows could save you up to 90% of the cost of replacing them. Aero Clear, operating since 1989, can repair and refurbish windows from a large range of pressurised and unpressurised aircraft, including but not limited to: Boeing Aircraft, Saab 340, Metroliners, Jetstream 31, Beechcraft 1900, King Air, Baron, Cessna 441 Conquest, Short Brothers, Embraer, Airbus, Dash 8, and ATR. We can also repair and restore canopies, including helicopters, landing light lenses, and wing-tip lenses on all aircraft. Aero Clear has pioneered a revolutionary process for refurbishing aircraft windows quickly, cost effectively, and to the highest international standards. Our ‘Optics Plus’ diamond milling machine returns crazed windows back to an ‘as-new’ condition for a fraction of the cost of new windows. We are CASA part 145 approved and carry out all repairs in strict accordance with the aircraft manufacturers guidelines. After repair and refurbishment, all windows are ultra-sonically tested before release to service to meet IAW manufacturers strict requirements. In-house repairs in our Armidale facility have a two day turn-around time (if required). Alternatively, on-site repairs can be carried out when time doesn’t permit removal and resealing of windows. We have carried out on-wing repairs all around the world. We supply our services to the Aviation Industry through CASA Approval No: 2423, Maintenance Authority N6/90 and Non Destructive Testing Certification NDN 308 (ultra-sonic thickness). Unique process and unbeatable service.